About the article: This mini-review highlights a tool which is used to predict the non-coding circular RNAs in plants genome. The non-coding circular RNAs (circRNA) play important role in controlling cellular processes. circRNAs are covalently bonded continuous closed loops which originate from the exonic region, known as exonic circRNA, but they can also arise from the intronic and the intergenic regions. CircRNAs can serve as a miRNA sponge [1,2] and are capable of enhancing the transcription of their host genes [3,4]. A new rRNA-depleted high-throughput RNA-Seq technology has revolutionized the discovery of circRNA in most of the species such as the mouse, human, rice and Arabidopsis [5,6]. There are several circRNA prediction tools available such as find_circ and CIRCexplorer, which were primarily developed using the databases of animals or humans [2,7,8-10]. Since these prediction methods are used to predict cricRNA for animal genomes and there is a large difference between the genome of animals and plants, therefore, these method can not be used to predict the cricRNA of plants, otherwise, the results would not be accurate [11,12]. Li et al.,(2016), has developed a software known as “PcircRNA_finder” to predict the circRNA in plants genome . 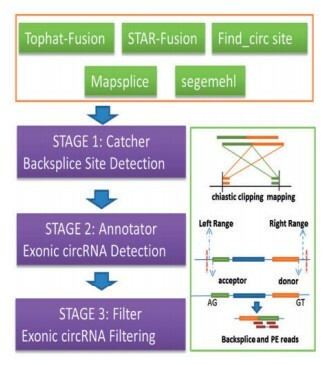 It maps the paired-end reads and collect all backsplice sites on the basis of presently available fusion detection methods such as STAR-Fusion , Tophat-Fusion , find_circ , Mapsplice  and segemehl . This gives backsplice sites and false positive sites which are filtered by the other module. It annotates the candidate exonic backsplice sites on the basis of the available gene annotation . It has been proved by recent studies that the backsplicing sites of circRNAs are flexible and their alternative splicing of circRNAs is prevalent [9,17]. Li et al., (2016) allowed the 5-bp flanking as many of the alternative splice sites occurred near the canonical splicing sites . i) Creates a pseudoRef file which holds all the flanking sequences of chiastic backsplice sites. ii) Maps raw reads to it. iii) Confirm the backsplice sites. PcircRNA_finder has been found to be more accurate after testing with a benchmark dataset by Li et al., (2016) . Memczak,S. et al. (2013) Circular RNAs are a large class of animal RNAs with regulatory potency. Nature, 495, 333–338. Li,Z. et al. (2015) Exon-intron circular RNAs regulate transcription in the nucleus. Nat. Struct. Mol. Biol., 22, 256–264. Zhang,Y. et al. (2013) Circular intronic long noncoding RNAs. Mol. Cell, 51, 792–806. Lu,T. et al. (2015) Transcriptome-wide investigation of circular RNAs in rice. RNA, 21, 2076–2087. Ye,C.Y. et al. (2015) Widespread noncoding circular RNAs in plants. New Phytol., 208, 88–95. Dobin,A. et al. (2013) STAR: ultrafast universal RNA-seq aligner. Bioinformatics, 29, 15–21. Wang,K. et al. (2010) MapSplice: accurate mapping of RNA-seq reads for splice junction discovery. Nucleic Acids Res., 38, e178. Hoffmann,S. et al. (2014) A multi-split mapping algorithm for circular RNA, splicing, trans-splicing and fusion detection. Genome Biol., 15, R34.